I have often been asked in conversation if I think that the superhero movie bubble is about to burst, or indeed whether it already has. Usually, Avengers Assemble is at the core of this discussion. “I mean, that can’t outdo THAT can they?” Another case in point in these discussions is TV’s Agents of S.H.I.E.L.D. being a little lacklustre. Iron Man 3 being more Tony Stark 3 than our hero and so on. When these discussions appear, I always say the same thing: “In Joss We Trust”. In fact, I think I’ll have a t-shirt or a wrist band or maybe both made up with that slogan. 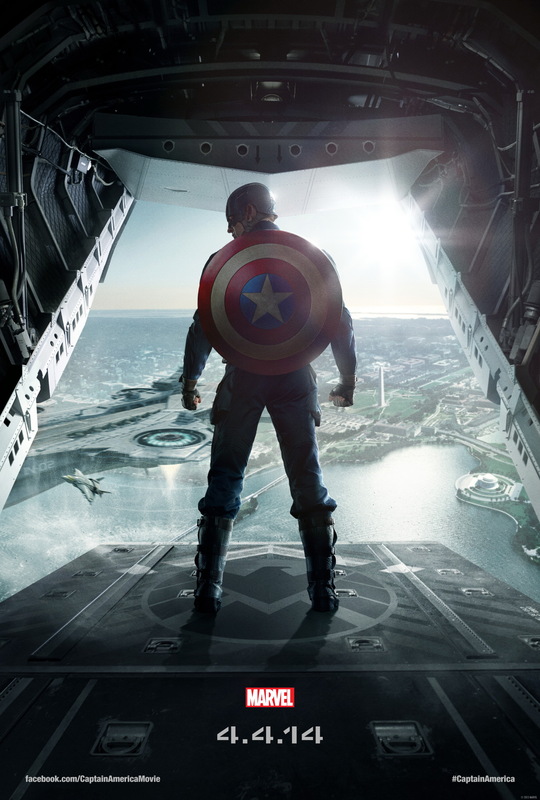 Captain America: Winter Soldier is a film that proves my sentiment is completely, one hundred percent on the mark. The Marvel movie universe is at this point more intricate and interwoven than I had dared hope, it’s a multi layered epic that comes to us a few cinematic episodes per year and didn’t end with Avengers Assemble with everything since being somewhat lesser. Nope – Winter Soldier shows us exactly how it’s all fitting together and gives a tantalizing glimpse of how it can go in a number of different directions in the future. Let’s do the spoiler free bit first. Let’s get a little bit of perspective. Since the tent pole movie event that was Avengers Assemble, we’ve seen a despondent, depressed, anxiety ridden Tony Stark suffering from a post traumatic stress syndrome after the battle of New York while dealing with Extremis. We’ve seen Thor in action in Greenwich battling against Malkith and the Aether as they battled in the multidimensional Convergence. S.H.I.E.L.D. were conspicuous by their absence in those films, but the events of both films were followed up in the Agents of S.H.I.E.L.D. television series. So, really the TV show is kind of the link between the films, and to get the whole experience, you need to watch the show. Captain America is one of S.H.I.E.L.D.’s top operatives and has been keeping busy since Avengers as a kind of star spangled, red, white and blue super agent. Being dropped without a parachute to rescue a ship hijacked by pirates and also a classic comic villain named Batroc the Leaper who is an expert in the French martial art of Savate is no problem. Cap is there, and if challenged to fight without his shield, then damn it, he will! Surprisingly, this is as much the story of the Black Widow as it is Captain America, with her character becoming fully fleshed out to an extent that I don’t think a solo Widow movie with Scarlett Johansen would be a bad idea. Previously I’d have said that maybe a team up of the Widow and Hawkeye would be awesome, but as Hawkeye isn’t in this film and I really didn’t miss him, let’s just go with the Widow. I didn’t think I’d ever see The Falcon in a movie for some reason – but hey, what a great creative choice and what a cool addition to the team the good Captain’s forming. In a plot that resembles something of our own surveillance obsessed world, Nick Fury now has a fleet of helicarriers ready to constantly watch the world while also guarding over it. S.H.I.E.L.D. are everywhere, and so are their enemies. Worse yet, is that there’s a super assassin called The Winter Soldier on the prowl – one who seems to be almost legendary, and has been around for years, he turns up, does his job and disappears. As Rogers notes: “He’s fast, strong and has a metal arm”. Yeah – fast enough to catch a flying shield and throw it back like a frisbee. While questioning the morality of a government organisation that constantly watches over its citizenry, Cap himself becomes a target from within and outside. The underlying theme becomes who watches the watchers. It’s more of an espionage tale than a flat-out super hero film, which is exactly what the Captain America comic books have become these days, and the film certainly does not disappoint on any level. Chris Evans’s earnest and naïve Steve Rogers is pitch perfect – still locked in the morality of the forties, and unable to comprehend or accept the lengths our enforcement agencies will go to (or stoop to) in the interests of what they perceive to be “national security” while pursuing their own agendas with evil, corrupt men like Alexander Pierce (Robert Redford) at their head. (Really, they had to give the bad guy the last name of “Pierce”?) But although that’s an underlying plot thread, it’s not the main one. I’d love to tell you more, but I really want you to see this as unspoiled as I did. It’s a great movie and you ARE going to need to see this before seeing ANYTHING else in the Marvel universe, I think. It is literally the second best super hero movie Marvel have released, second only to Avengers Assemble. Okay, if you haven’t seen the film, you know how this goes – right? We’re about to enter The Spoiler Zone where I chat about the movie with those who have seen it, so in the interests of fair play, I want you to stop reading now. Go and watch the film – enjoy it, and come back. Oh – and don’t DARE leave the cinema until you’ve seen BOTH post credit stings. There’s one in the middle of the credit crawl, and the other is at the very, very end. Don’t be bullied by the usherettes, stand your ground. 1 Have they all gone? Just us who’ve seen it? It’s been a week since I saw the film and I’m still thinking about it. And I want to see it again. I read the Winter Soldier graphic novel a couple of weeks before seeing the movie and I’m still blown away by the movie. Will the story lead into The Death of Captain America storyline or a variation of it? It’s certainly possible. Certain elements of that story are now in place, Nick Fury is missing. Bucky (Winter Soldier) Barnes is around, still loose and is by the last sting, beginning to put his past back together and is remembering. What has blown me away more than anything though is the sheer scope of the story – the small details that don’t really strike you until you’ve actually left the cinema. We saw Gary Shandling as Senator Stern in Iron Man 2 heading a Congressional Committee bent on trying to get Stark’s Iron Man armour. Here we see him arrested as an agent of HYDRA, who are still around and have completely infiltrated S.H.I.E.L.D. So, Iron Man’s armour came THAT close to being seized by HYDRA? Back then? Did we see Zola transfer himself from the computer to the flash drive? Did that happen, or is it wishful thinking on my behalf? Is Zola somehow going to become part of the Ultron storyline in next year’s Avengers film? Come on, he IS literally a living computer now. Baron Von Strucker made his debut? The man who can single handedly make a monocle cool? And he has Loki’s staff…..with some of the Infinity gems AND Tesseracht technology – in the hands of HYDRA? S.H.I.E.L.D. all but disbanded? How’s THAT going to be addressed on the TV show – you know it’s going to have to be. Are Coulson and his team going to become renegades? We see Maria Hill is now working for Stark Industries. Interesting. The final card on the credits of Iron Man 3 read that Tony Stark would return. Nothing about Iron Man – does this mean that Stark could become the new director of S.H.I.E.L.D. or its replacement in Fury’s absence? He did in the comics. And speaking of Fury, did anybody notice the inscription on his grave stone? “The Path Of The Righteous Man”? The mention in passing of Stephen Strange (no, NOT the lead singer of Visage, for crying out loud) which begins to set up Phase 3 to kick off next summer with Ant Man, a month after Avengers: Age of Ultron is released. Marvel’s possibilities at this stage are limitless. No wonder Warner/DC are nervous about Captain America 3 being released on the same day as Batman vs Superman. I have one teeny, tiny small problem. We saw brother and sister Quicksilver and Scarlet Witch. Okay, they are part of the Avengers line-up from way, way back in the sixties. However, they’re NOT the same Quicksilver and Scarlet Witch we’ll see in the upcoming X-Men: Days of Future Passed. Well, they are….but they’re not. Originally, Quicksilver and Scarlet Witch were part of Magneto’s Brotherhood of Evil Mutants in the X-Men comic before reforming and becoming heroic and joining the Avengers after Iron Man, Thor, Giant Man and the Wasp had left. Fox have the rights to use those characters in their X-Men films, as well as the term “mutant”. Marvel ALSO have the rights to use those characters, but can’t refer to them as “mutants” due to copyright issues. So, my question – is it going to be at all confusing that there will be two different Quicksilvers and two different Scarlet Witches played by different actors in different franchises over the next couple of years? Want to chat about what we saw? Head on over to the facebook page. Copyright © 2010 - 2014 Robin Pierce. All Rights reserved.